Congratulations – if you are a resident of Minneapolis or St. Paul you are currently living in the coldest metropolitan area in the U.S.! That means that you definitely were getting your money’s worth with your home heating system this winter. Although other parts of the country may be experiencing warmer weather already, here in the coldest metropolitan area in the U.S we are still experiencing winter like temperatures. According to research from Current Results Nexus, the Twin Cities has the lowest daily winter mean temperature (17.3 degrees), maximum temperature (25.6 degrees), and minimum temperature (9.0 degrees). 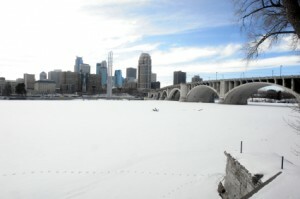 The Twin Cities is known for its extreme weather, both hot and freezing. So it’s a great place for a heating and air conditioning business, but it’s also a great place to live. In fact, a recent article from Forbes.com ranked the Twin Cities a better winter habitat than Cleveland, Boston, New York City, Milwaukee, and Chicago. Why? Although we have colder winter temperatures than all those places, we don’t have as much miserable weather (especially sleet, fog, snow, and rain). Despite the cold weather, folks living in the Twin Cities enjoy plenty of sunshine to get outside and enjoy skiing, snow shoeing and ice skating. Regardless of where you live, when you come in from the cold make sure your home heating system is working at peak efficiency. The official start of spring is drawing closer. Gear up for air conditioning season with Three Air Conditioner Tips for Twin Cities Summer Survival! If you need service on your heating or air conditioning system call Welter Heating and Air Conditioning 612-825-6867 for service or installation.